Formal Portrait is usually intended to depict the Subject in the most presentable manner. This kind of photography usually taken within a photo studio environment. This article describes a typical studio setup for taking Formal Portrait. This setup is fairly common for home studio as well. For this kind of project and work, cameras and photographic equipments are expensive. The investment into this kind of setup can easily amount to thousands of dollars. Therefore, it is always wise to be carefult with the buying decisions of these equipment. 1. Props and Posing aids. These are used to help the subject pose better. This may includefurnitures such as like stools and chairs. 2. Backdrop. There are several options for backdrops. This includes large paper draps and muslin fabric backdrops. To prevent sharply angled shadows, the backdrops are often allow to flow vertically from the top to horizontally on the floor, forming a 90 degree angle. 3. Lighting. 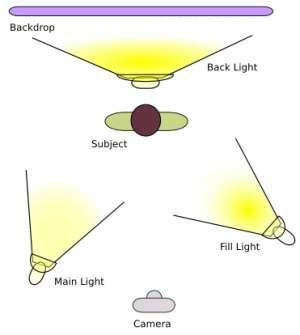 Most often the set up consists of a Main light in addition to another one or two Fill Lights. Typically, the Main light is stronger than the Fill light. The purpose of the Fill light is to prevent stark and dark shadows. Fill Lights are put in areas where the main light is not providing enough brightness. 4. Light modifier. These are usually diffusers made to soften direct lighting. 5. Light Reflectors. These are used to bounce light towards the subject. Umbrella (for photo studio) is often used for this purpose. To use the reflector, lighting bulb must face away from the subject. Instead the light bulb is pointed towards the umbrella. The umbrella, in turn, will reflect light towards the subject. Because light is scattered and defused by the reflector, the resultant photo is often more beautiful, softer and less stark. Umbrellas are popular partly because they are a relatively low cost solution. 1. Reflective Umbrella which is designed to bounce light and usually has metallic looking reflective surfaces. 2. Shoot-through umbrella which is usually translucent to allow lights to pass through. Because of the artificial lightings used, appropriate White Balance setting must be taken into consideration. As a side note, when buying a camera or equipment, is it always good to go for the cheapest offer? Perhaps not. There are some camera vendors who will sell you photographic equipments at a much reduced price. However, one must be suspicious if the offer is far below market price. Why is that so? Apparently, there are some dishonest sellers who will sell to an unsuspected buyer a camera package, only to have certain accessories or parts omitted from the package. Sometimes, the parts omitted can be quite hard to be acquired separatedly. In this case, one might be forced to go back to the same seller again to buy the omitted parts. In the end, the entire complete package might have cost more than the market price. As unscrupulous as this might sound, this is how some businesses make money. Therefore, it is always advisable to think twice before buying camera and photographic equipments at prices that are way below market rates. Digital tools for 3D visualisation works.